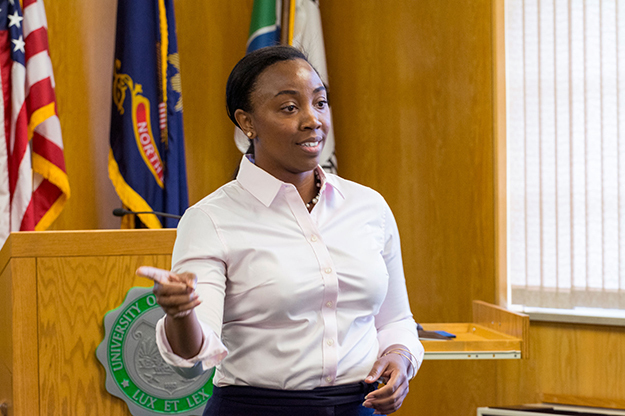 Angelique Foster, Special Assistant to the President, was tapped to lead the implementation of the One UND Strategic Plan. Photo by Richard Larson. Special Assistant to the President Angelique Foster is leaving her position to move closer to family. 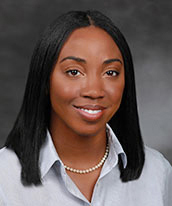 Foster, who grew up in North Carolina, plans to leave the University in May after helping the new special assistant transition into the new job. The position description should be finalized this week, and the position will be advertised after that. Foster, who holds a BFA in theatre and an MFA in stage management from the University of CA – Irvine, compared the job to that of a stage manager. Foster first began working for Mark Kennedy in 2012, when he served as professor and director of the Graduate School of Political Management at George Washington University. When he was named UND’s 12th president, he asked her to be his executive assistant. At UND, Foster has served as implementation lead for the One UND Strategic Plan, served on search committees, including the one which brought Vice President for Marketing & Communications Meloney Linder to campus, organized Martin Luther King Jr. Day, and sits on the board of the Empire Arts Center. She also speaks to theatre arts classes. But, Foster said, she misses her family. She grew up in North Carolina, and plans to move south to be closer to family members. Foster said she has also enjoyed Grand Forks and UND. “From day one, I felt welcomed in the community,” Foster said, remembering that when she and her mother purchased a new bike, they had trouble fitting it into Foster’s Honda Accord. Foster said that what she will miss most are the relationships she fostered (pardon the pun) at UND.